Founded in 1906, Van Cleef & Arpels is one of the most established and prestigious names in the jewellery world. And rightfully so, considering its resplendent designs and knack for constant innovation. This year has been particularly hectic for the French maison, with its recent launches of the Bouton d’or and Quatre Contes de Grimm collections. The former was a dazzling assortment of coloured gemstones set in paillette motifs, while the latter showcased whimsical pieces inspired by Grimms’ fairy tales. It doesn’t stop there, with yet another sparkling addition to Van Cleef & Arpels’ ever-growing treasure trove: New bracelet designs for its existing Perlée range, which features dainty gold beads as a recurring motif. This collection was first introduced a decade ago, but the brand has been including gold beads in its designs since the 1920s. 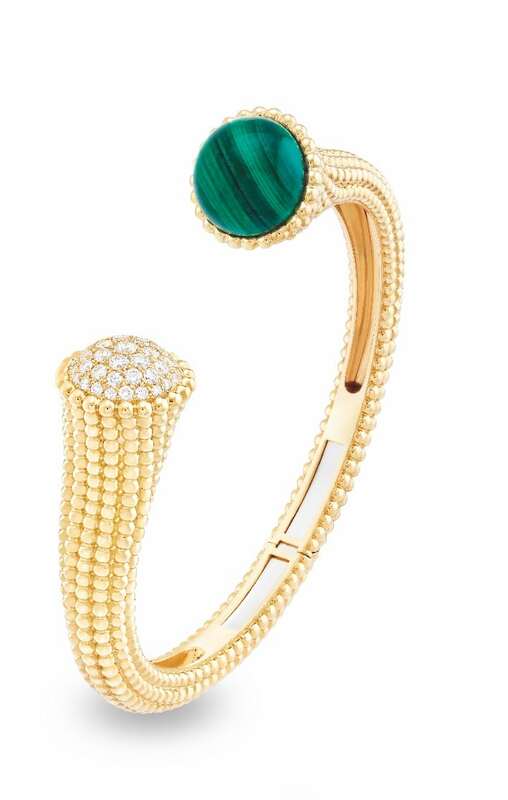 The new jewels include the open-shank Perlée couleurs bracelets, which come in three different combinations of gold and coloured cabochon gemstones. Yellow gold is contrasted with dark green malachite, while white gold is paired with turquoise, and pink gold matched with carnelian. All three bracelets are available in three sizes, and adorned with diamonds on one end — making them look extra lavish. If the Perlée couleurs bracelet’s design looks familiar to you, it’s because of its similarities to Van Cleef & Arpels’ Perlée couleurs Between the Fingers ring, which was introduced to the same line in 2016. The bracelet resembles an upsized and more extravagant version of the ring with its rows of gleaming beads that snake along the entire length of the band. 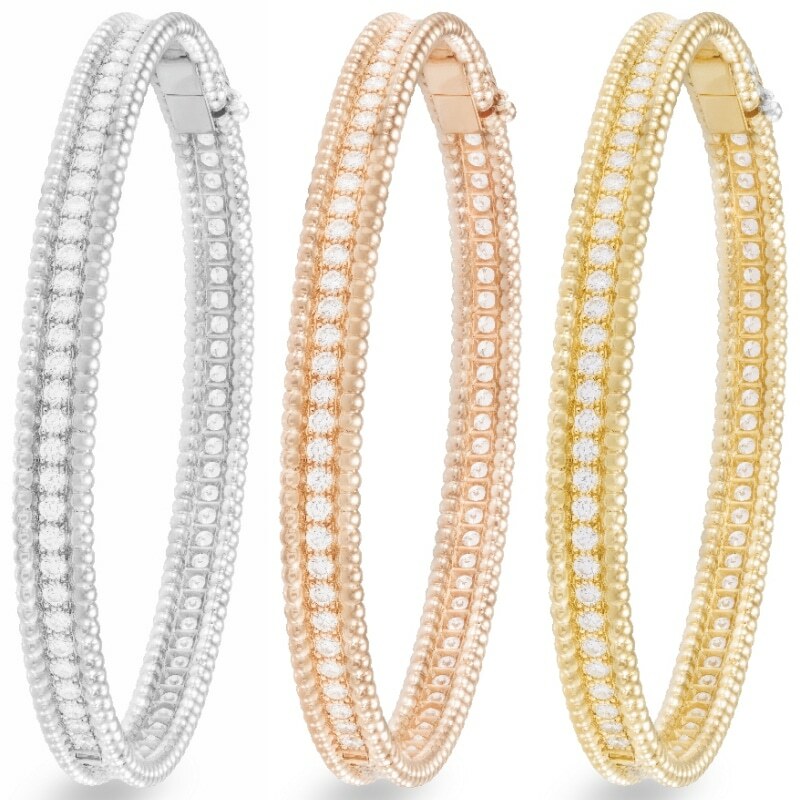 Also new to the collection are three Perlée diamonds bracelets, which come in white, pink and yellow gold. Each bangle comprises a row of round diamonds that’s flanked by delicate gold beads on both sides, and its clasp is discreetly hidden at the back to keep its silhouette clean and sleek. An openwork structure helps light to pass through the jewel easily, causing the diamonds to shimmer more. The bracelets are best worn layered in twos or threes for a more striking look. They are offered in four sizes ranging from very small to large, and are versatile enough to be coupled with other designs in the Perlée range. Compared to some of Van Cleef & Arpels’ other creations — especially its more elaborate high jewellery designs — the Perlée collection carries a more understated aesthetic. But much effort goes into the craftsmanship of every single jewel. 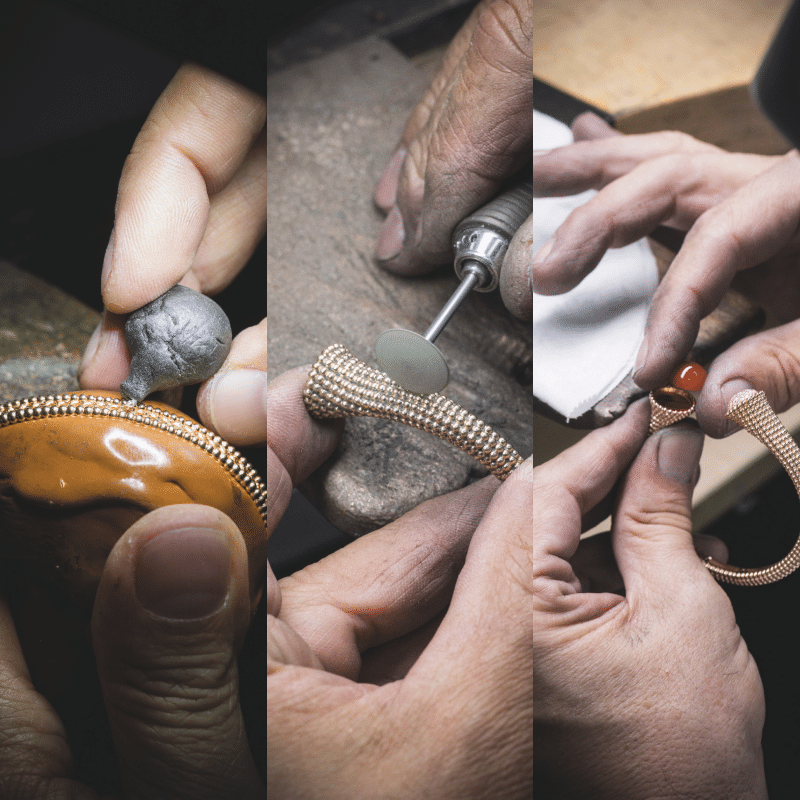 Each bead is set by hand, and painstakingly polished till it shines. Even the inner surfaces of the pieces — despite their not being visible when the jewels are worn — are mirror-polished to perfection. These stringent standards extend to the diamonds that Van Cleef & Arpels uses, which are in the coveted colours of D, E and F (all of which are almost colourless), and possess a clarity of IF (Internally Flawless), VVS1 or VVS2. The brand’s coloured stones are also scrupulously chosen: The turquoise is required to have an opaque, uniform consistency throughout, while deep green malachite with natural, regular streaks is favoured. As for the red-orange carnelian stones, they are polished to enhance their lustre. View the full range of Perlée jewels here.